Thanks for coming to fix our fuse twice and help us with the broken lamp! We can't wait to come again! It was great. I keep picking the five stars but it only fills in 4-1/2 stars. I say 5 stars. As usual, a comfortable stay in a very clean home near the beach. I will use these services again and recommend them to anyone. I was surprised for such an old house and dog friendly, how clean the house was and the extra amenities like good coffee with a grinder, makeup wipes, hair spray and a hair dryer, etc. The beach access was fantastic as well as the views. I would definitely recommend this to my friends with pets! Excellent service, everyone was exceptionally nice and accommodating! We had a wonderful time at Cannon Beach. We would stay every year if we could! They were all very friendly and helpful. Very friendly, knowledgable and helpful. Good, maintenance team responded quickly when we called on first morning. The team is wonderful. Susan is so friendly and always helpful. All of the team is great. The only negative I have is that the owners need to have their dryer venting cleaned. It is a bit scary to use. Thanks for the heads up! Traveling with three young kids is never easy. However staying at this rental was as close to being at home as possible. We had everything we needed right there on the beach! 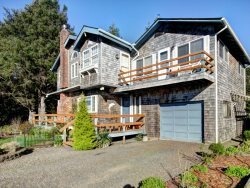 Cannon Beach/ Arch Cape Rentals are so friendly and easy to work with. The properties are perfect for family-friendly and romantic getaways. This is our 4th year taking our teenage kids from Utah to Spring break on Arch Cape. We are so in love with the area. Arch Cape quiet, well located, the homes are well stocked, the views spectacularly beautiful and the hiking perfect. The rental property management could not be nicer or more accommodating. Beyond the truly amazing picture window views of the ocean and the great location: The cookware in the kitchen is brand new and a pleasure to use.The knives and pots were the best I've ever had in any rental vacation home. Also, I really appreciated the family friendly-ish DVD's that were there. Really made the evenings pleasant. Everything was perfect. Great unit, great location, efficient staff. Couldn't have asked for anything more. Thank you.